Mary Francisca "Mame" Hogan was born in October 1864 at PA. She died in 1932 at Pittsburgh, Allegheny, PA. She was buried on 9 March 1932 at Calvary Cemetery, Pittsburgh, Allegheny, PA.
Ellen C. "Nel" Hogan was born in December 1862 at PA. She died in 1956. She was buried on 5 September 1956 at Calvary Cemetery, Pittsburgh, Allegheny, PA.
Alice Hogan was born in 1869 at PA. She died in 1880 at Pittsburgh, Allegheny, PA. She was buried on 17 October 1880 at St. Mary's Cemetery, Lawrenceville, Pittsburgh, Allegheny, PA. She was buried on 23 February 1900 at Calvary Cemetery, Pittsburgh, Allegheny, PA.
Anne Margaret Hogan was born in May 1875 at PA. She married J. Toner Barr, son of John C. Barr and Sarah Toner. Anne Margaret Hogan died in 1948. She was buried on 19 April 1948 at Calvary Cemetery, Pittsburgh, Allegheny, PA.
Edmund J. Hogan was born in July 1878 at PA. He married Stella Good circa 1905. Edmund J. Hogan died in 1954. He was buried on 2 June 1954 at Calvary Cemetery, Pittsburgh, Allegheny, PA.
James Timothy Keating was born on 1 May 1879 at Rochester, Strafford, NH. He was baptized on 11 May 1879 at Rochester, Strafford, NH. He died on 2 July 1880 at age 1. He was buried at St. Mary's Cemetery, Rochester, Strafford, NH. James Hogan was born in 1861 at PA. He was baptized after 1861. He married Ida May Miles circa 1878. James Hogan died in 1940. He was buried on 29 May 1940 at Calvary Cemetery, Pittsburgh, Allegheny, PA.
Ida May Miles was born in 1861. She married James Hogan, son of Edward L. Hogan and Anna O'Neil, circa 1878. Ida May Miles died in 1938. She was buried on 30 August 1938 at Calvary Cemetery, Pittsburgh, Allegheny, PA.
James Edmund Hogan was born on 16 May 1897. He married Annette Fitzpatrick in June 1927. James Edmund Hogan died in 1990 at Marion Manor, Pittsburgh, Allegheny, PA. He was buried on 25 January 1990 at Calvary Cemetery, Pittsburgh, Allegheny, PA.
Leo J. Hogan was born circa 1887 at PA. He died in 1930. He was buried on 6 January 1930 at Calvary Cemetery, Pittsburgh, Allegheny, PA.
Edward C. Hogan was born circa 1885 at PA. He died in 1943. He was buried on 9 June 1943 at Calvary Cemetery, Pittsburgh, Allegheny, PA.
Ida Mae Hogan was born after 1878. She married George N. White. Ida Mae Hogan died in 1956 at St. Luke Hospital, New York, NY. She was buried on 8 August 1956 at Calvary Cemetery, Pittsburgh, Allegheny, PA.
Stella Good was born in 1876. She married Edmund J. Hogan, son of Edward L. Hogan and Anna O'Neil, circa 1905. As of circa 1905,her married name was Hogan. 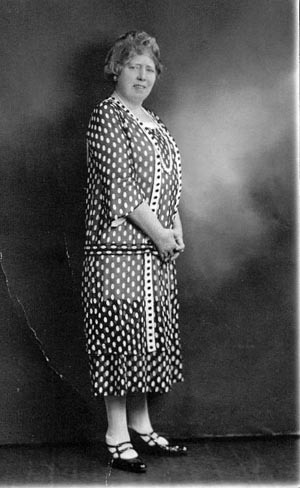 Stella Good died circa 1935. She was buried on 26 September 1935 at Calvary Cemetery, Pittsburgh, Allegheny, PA.
Anne (or Anna) Hogan was born circa 1909 at PA. She married Francis Lauinger "Frank" Vilsack, son of August A. Vilsack and Annie Louinger. Anne (or Anna) Hogan died in 1973. She was buried on 31 March 1973 at Calvary Cemetery, Pittsburgh, Allegheny, PA.
Mary Louise Hogan was born circa 1908 at PA.
Robert Hogan was born circa 1911 at PA.
J. Toner Barr was born in 1876. He married Anne Margaret Hogan, daughter of Edward L. Hogan and Anna O'Neil. J. Toner Barr died on 26 June 1925 at Pittsburgh, Allegheny, PA. He was buried on 29 June 1925 at Calvary Cemetery, Pittsburgh, Allegheny, PA.
Sara Elizabeth Barr was born. Rosemary A. Barr was born. John Toner Barr Jr. was born. Anne (or Anna) O'Donnell was born circa 1880 at Darlington, Beaver, PA. She married David Francis "the Duke" Page, son of David Page and Margaret Henrietta Lynch, before 1920. Anne (or Anna) O'Donnell died on 26 March 1957 at Mercy Hospital, Pittsburgh, Allegheny, PA. She was buried on 29 March 1957 at St. Mary's Cemetery, Lawrenceville, Pittsburgh, Allegheny, PA.
David Francis Page Jr. was born circa 1920 at PA.
Joseph M. Page was born before 1 June 1873. He was baptized on 1 June 1873 at Pittsburgh, Allegheny, PA. He died on 25 March 1891. He was buried on 29 March 1891 at St. Mary's Cemetery, Lawrenceville, Pittsburgh, Allegheny, PA.
Catherine M. Clinton married Austin W. Page, son of David Page and Margaret Henrietta Lynch, circa 1913. Clinton Page was born circa 1915 at PA.
Helen Page was born circa 1921 at PA.
Robert Page was born circa 1917 at PA.
Robert E. Mitchell married Helen Ruth Stout, daughter of Hiram Beuregard Stout M.D. and Clara Gertrude "Gert". Page. Robert E. Mitchell was born. Philip Burleigh Ferguson was born. He married Margaret Page Stout, daughter of Hiram Beuregard Stout M.D. and Clara Gertrude "Gert". Page. Philip Burleigh Ferguson died at Pittsburgh, Allegheny, PA. He was buried at Pittsburgh, Allegheny, PA.
Helen Ruth Stout was born in 1908. She married Robert E. Mitchell, son of Helen Ruth Stout. She died on 3 August 1941 at Rosarito Beach, Mexico. She was buried on 8 August 1941 at St. Mary's Cemetery, Lawrenceville, Pittsburgh, Allegheny, PA.